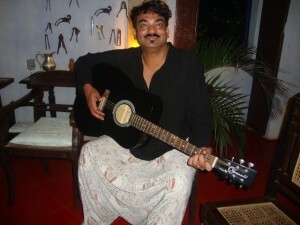 Among India’s most celebrated designers, Wendell Rodricks is unique in his almost austere avoidance of ornamentation and his emphasis on clean lines, simplicity and durability. He is also remarkable for being perhaps the only person in the fashion world who freely and regularly speaks his mind on matters ranging from gay rights to the protection of the environment, especially in his beloved Goa, where he does not hesitate to hurl defiance even at the highest in land (more prosaically be also offers a special line of clothing made with natural dyes and handwoven textiles). Wendell is, in addition, an excellent singer, a superb cook and a fine writer, with a very distinctive, natural voice of his own. I’ve seen a large chunk of his forthcoming memoir, The Green Room, and can attest it to be a riveting read. Much of it is about the Mumbai chawls of Wendell’s childhood and many of the scenes are still vivid in my memory. The Green Room has recently been acquired by Ravi Singh, who was with Penguin India for many years and has now joined Aleph Books, the new publishing house set up by David Davidar in collaboration with Rupa. Ravi is an outstanding editor (he published both Sea of Poppies and River of Smoke) and I am sure The Green Room will make a big stir when it is released (it is certainly spiced with some very garam masala). But Wendell has yet another talent. He regularly sends his friends funny stuff from the Net. Here are some examples.